Left to right - Naleen Andrade MD, president of the American College of Psychiatrists, Arshya Vahabzadeh MD, Emory psychiatry resident, Sidney Zisook MD. professor of Psychiatry and chair of the Laughlin Fellowship Selection Committee. 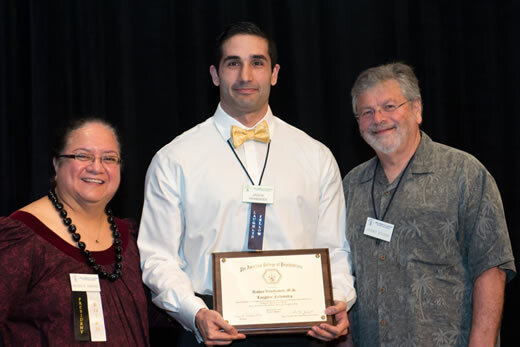 The American College of Psychiatrists recently recognized Arshya Vahabzadeh, MD, as one of the 2013 recipients of its prestigious Laughlin Fellowship at the College’s Annual Meeting in Kaua’i, Hawaii. Vahabzadeh is finishing up his third year of training in the Department of Psychiatry and Behavioral Sciences at Emory University School of Medicine. Named after College founder, Henry P. Laughlin, MD, the Fellowship program was launched in 1976 to recognize outstanding accomplishments by psychiatry residents in the United States and Canada. Each year, the College selects ten residents deemed most likely to make a significant future contribution to the field of psychiatry. The College provides a stipend for the Laughlin Fellows to attend the College’s Annual Meeting and participate in all educational functions, allowing them to interact with College Members, as well as their peers in other residency programs. "These ten outstanding psychiatrists represent the future of the specialty," said Sidney Zisook, MD, chair of the Laughlin Fellowship Selection Committee. "We’re proud and honored to welcome them to the College." Vahabzadeh is deeply interested in neurodevelopmental disorders including autism and schizophrenia. He is also interested in public education and fighting the stigma associated with mental illness. His research has encompassed several lines of study including novel psychopharmacology, social cognition, and genetics. "I am grateful to receive this highly prestigious award. I am fortunate to have had the mentorship of some of the foremost neuroscientists, psychiatrists, and psychologists," says Vahabzadeh. "The challenges in improving the nation’s mental health and understanding these disorders remains immense, but I am confident that our work will continue to help patients, their families, and our society." Vahabzadeh is a recipient of both the American Psychiatric Association's Leadership Fellowship and the American Medical Association Foundation’s 2013 Fellowship Award. He has published and presented over 40 papers, articles, posters, and book chapters since starting residency. He is the upcoming Editor-in-Chief of the American Journal of Psychiatry Residents Journal, and is also a regular contributor to the APA HealthyMinds blog. Vahabzadeh will be headed for a fellowship in child and adolescent psychiatry in Boston this summer.